My daughter and I had six days in Oxford, three of which we used for day-trips—one to Stonehenge and two into London. Our final day in Oxford we dedicated to Lewis and Tolkien. On the Saturday, we got a bus on the High Street and headed to our car-park. The plan was to visit the places where Lewis and Tolkien had lived. The Kilns is the house where Jack Lewis lived with Warnie, his brother, Mrs. Moore and her daughter Maureen. They purchased the house together in 1930, which is around the same time that Lewis was becoming a Christian—something that happened over the period of several years. The Kilns is outside of Oxford at Headington Quarry, but we found the house in only a few minutes. Parking the car along a side street, we walked into what is now called Lewis Close—the short street leading up to the house and nature preserve. The house is unremarkable. It’s a quiet house on a quiet street. 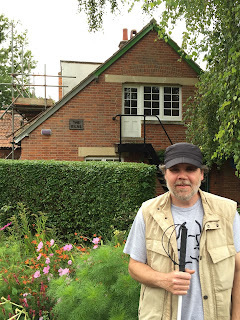 The place is maintained privately by the C. S. Lewis Foundation, so we weren’t able to get inside. I didn’t mind, particularly. This is the house where Lewis lived, and died, November 22, 1963. We crossed the street and entered the park. The park has a pond—they call it a lake—and we walked about for a while. I was a little distressed at the amount of litter, and I got stung by nettles. A young family was also making their way through the park—a boy, apparently with the name of Jack, tagging along behind. Leaving the park, I feltsomehow let down, but I wasn’t sure why. What exactly did you expect? I asked myself. We stopped at the house once more, and I kept looking for the connection I wanted to feel. This was the place I had read so much about. This was the place where Lewis had lived for over thirty years. 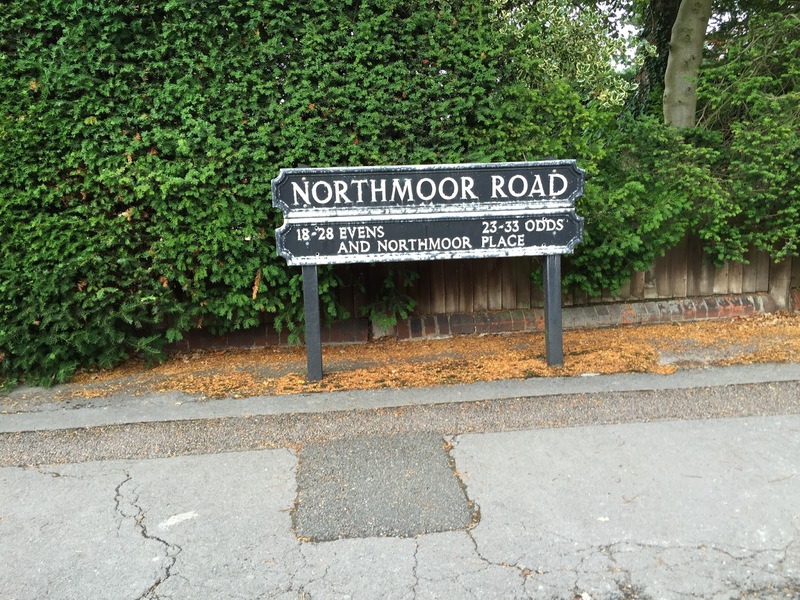 Back at the car, we plugged Tolkien’s old address into the satnav and headed for Northmoor Road. 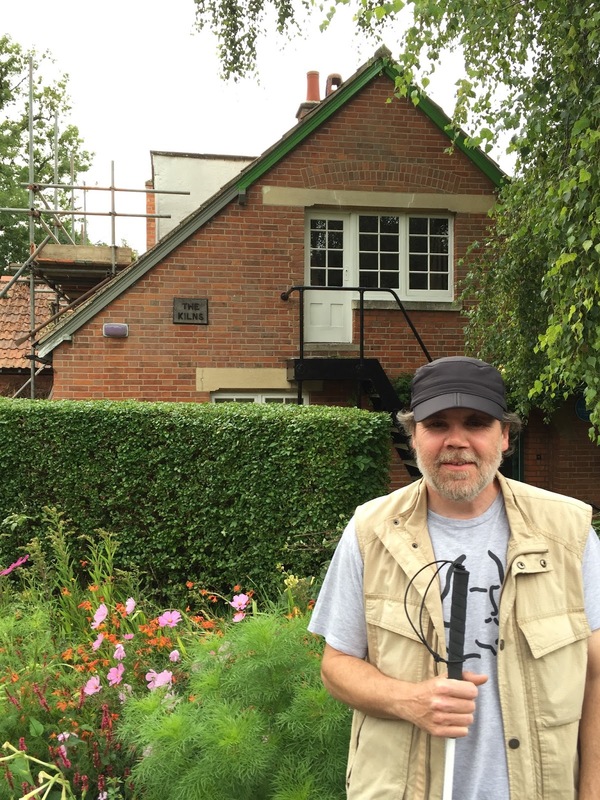 And there, in not very long, was the house, number 22, one of two houses on this street where Tolkien lived with his family. The houses were tall and brick, and not the sort of place you would think the author of Lord of the Rings would live. But Tolkien, even more than Lewis, lived an ordinary life—married with four children, and working hard to raise a family. 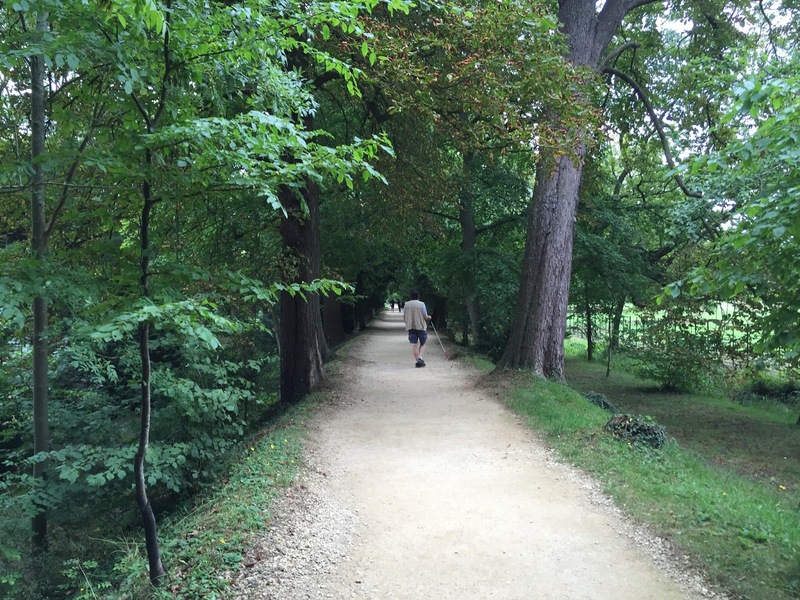 After Northmoor Road, it was back to the car-park and Magdalen College. We wanted to look around the college grounds. We had to enter through the porter’s door again, but this time it seemed more normal—two lovely young women nodding and smiling, and handing us a leaflet on C. S. Lewis. We found New Building right away, the building where Lewis lived on campus, and the place where the Inklings gathered in Lewis’ rooms on Thursday evenings. We wandered around inside another of the buildings, passing other visitors and students looking for their classrooms. A wedding was going on inside one of the courtyards, and the bells rang out from Magdalen Tower. We saved Adison’s Walk for last. It’s a peaceful path encircling a deer park in the centre. Trees border the path, and a little river runs along one side. As I walked along, I thought of Tolkien, Lewis, and Hugo Dyson walking here in September of 1931. It was late, after an Inklings meeting, and the three men walked and talked of myth. Now what Dyson and Tolkien showed me was this: that if I met the idea of sacrifice in a Pagan story I didn’t mind it at all: again, that if I met the idea of a god sacrificing himself to himself I liked it very much and was mysteriously moved by it: again, that the idea of the dying and reviving god (Balder, Adonis, Bacchus) similarly moved me provided I met it anywhere except in the Gospels. The reason was that in Pagan stories I was prepared to feel the myth as profound and suggestive of meanings beyond my grasp even though I could not say in cold prose ’what it meant’. … Now the story of Christ is simply a true myth: a myth working on us in the same way as the others, but with this tremendous difference that it really happened: …. I felt closer to Lewis and Tolkien on Addison’s Walk than I had anywhere else. Maybe it was the quiet, broken only by the sound of bells from the college—or maybe the relative solitude of this place gave me the chance to fully appreciate where I was. It wasn’t Narnia or Middle-Earth, but I was finally getting a glimpse into the lives of these men who lived very structured lives: teaching, reading, and researching; meeting with friends often to talk and drink and smoke, arguing about religion, philosophy, and pedagogy; and finally retreating into their imaginations to create and write into being the worlds that so many have come to love. Lewis, C. S. C. S. Lewis, Collected Letters, Volume 1: Family Letters, 1905 to 1931. Ed. Walter Hooper. London: Harper Collins Publishers, 2000. 975-76. Print. Reading about Lewis, Tolkien, and the other Inklings is something I’ve done for many years. 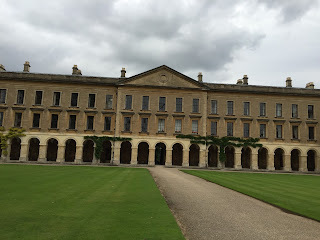 I finally had the chance to visit Oxford this last August with my daughter, taking the time to visit Magdalen College where Lewis taught and lived, and to think about these men living their lives in Oxford more than half a century ago. My daughter and I arrived in Oxford late on a rainy Monday. We had to leave our car in a car-park and take a bus into the city. Because it was late—nearly midnight—and we were tired and hungry, the whole thing seemed surreal to me. We got directions from our helpful bus driver, and set out to find the porter’s door where we could pick up our keys. We had reserved two rooms in the residence at Magdalen College. Did I say it was rainy and dark?—that we were tired and hungry? We hauled our suitcases along the imposing wall of the college, past occasionally by groups of drunken students—something I later learned has been a feature of the city for more than five hundred years. We were lost. We were definitely at the college, but where was the door? We crossed the High Street, and my daughter spotted a darkened door in the forbidding stone wall of the college. It was unmarked, but there seemed no other entrance. WE went to it and rang the bell. A wizened little man let us in, and we told him we had booked rooms at the college. He shuffled around until he found our names, then handed over two sets of keys. I’m in a Dickens novel, my tired brain said. I knew I was in a Dickens novel; if I were in a Harry Potter novel, things would seem even weirder. We finally got into our rooms, and in a moment of weakness I wished desperately I was at home, and not in this strange place. Sleep, coffee, and a full English breakfast the next morning made Oxford look much friendlier. It was still raining, but a rainy morning with the street full of people was much different from what we had met with the night before. The place we found to eat was The Rose—a snug little café down High Street from Magdalen. We went back to that café several times over the next few days. We spent the first day wandering about Oxford. We had a bus tour of the town, which was helpful and informative. We spent time in the Ashmolean Museum, which was a nice way to escape the busy streets and the rain. We walked until we found The Eagle and Child, the pub where the Inklings met, often on Tuesday mornings, and called by them The Bird and Baby. 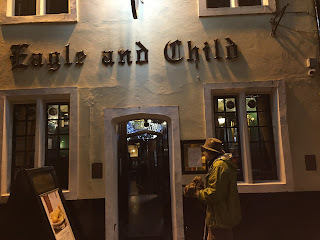 We went back to the pub that night for dinner, and as we ate, I tried to imagine Lewis, Tolkien, and the other Inklings sitting here, drinking and smoking and having spirited conversations. As we walked back to our rooms, evening was settling fast. It had stopped raining, and the streets and pubs were filling with people. As we walked, I had to reconcile my sense of the past with this busy, vibrant present. 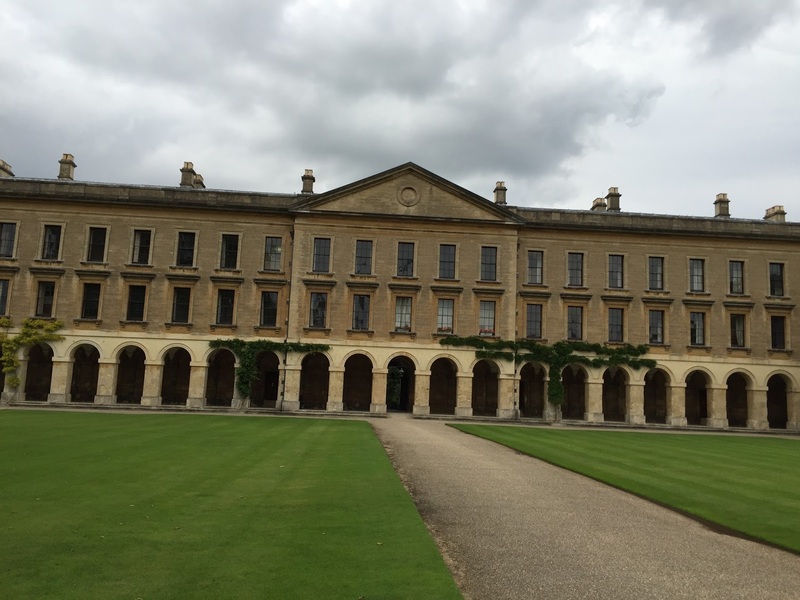 Oxford has been a centre of learning in England and Europe since the eleventh century. 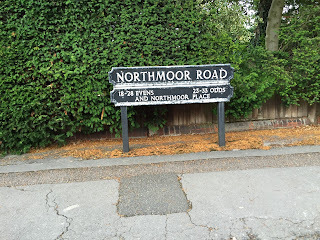 Its history is long, and Lewis, Tolkien, and the other Inklings are only a small part of that history, but I was intent on discovering something of them while I was here.